A solid-sounding, pretty- portable stage piano at a very appealing price. There are areas that need refining, but it’s still a contender in this very competitive market. Portable for an 88-note weighted 'board. Looks cheaper than the competition. Dexibell (a Proel brand) was set up by Fabrizio Sorbi, after purchasing the ex-Roland Europe factory in Italy. The S7 is available in 73- and 88-note variants and has a very European, almost 1990s look! Both models have a textured grey-painted metal case, and this review model came with pinky/red plastic side panels which can be swapped for panels in various colours (including black, green, white, blue and yellow). For an 88-note weighted stage piano, the S7 is fairly portable too, weighing in at 17.5kg (38 lbs). Bear in mind though, you’ll want to case it for gigs which will bump up the weight. Fatar has supplied its respected TP-40M keybed for the S7, featuring ‘triple contact hammer action’ with Ivory Touch (textured key surface). It feels very precise to play and nicely balanced. 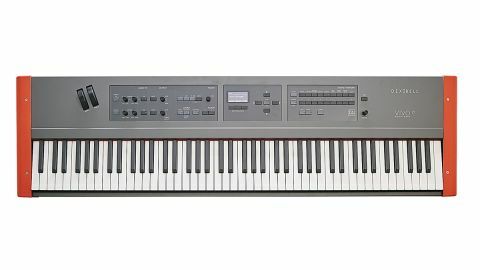 Importantly, it’s not too heavy and responds quickly when playing the onboard synth and clav sounds, (as well as for detailed piano/EP playing), plus there are seven response curves and eight types of keyboard temperament (tuning) available, including stretch tuning. Our only criticism regarding the keys is that some notes sounded a little louder than others (acoustically). One other quick criticism is the use of a wall-wart power supply - a proper mains connector and onboard supply would have been sturdier long-term. Now let’s examine the front panel! First up, there’s two angled pitch and mod wheels that feel solid, and though they’re some distance from the keybed, they work fine in practice. One odd choice is that instead of the usual under-wheel octave switches, there’s just one octave switch button some distance away, which works in conjunction with the left/right cursor buttons. The mod wheel can be handily assigned to various settings, including modulation and organ rotary speed. Next up on the left, there’s a master EQ section, whose four EQ dials also double as MIDI control dials when using the To MIDI button. To add further polish to your sounds, there are 24 reverb types and 15 other solid-sounding effects available with seamless changing (so that reverb and delay don’t cut when changing patches). Each of the three parts can also have two effects running simultaneously, enabling detailed, independently effected sounds for each part. There’s plenty of connectivity available, with damper pedal, assignable expression pedal and pedal switch. There’s some clear forward-thinking going on at Dexibell - there’s Wi onboard, and you can stream audio to the S7 over Bluetooth too. In addition, you’ll find handy front-mounted headphone sockets (hooray!) and an audio input jack, plus USB connections and memory slots. Oh, and there’s standard MIDI DIN as well! Following this is the output section, which allows muting/levelling for the three available keyboard parts: main, lower and coupled (layered), so you can quickly tweak levels within your split, layered or main sounds without menu diving. This section also features a song recorder which allows the recording of audio (WAV) data to a USB stick. Finally (in this section), there are two assignable switches along with a chord freeze function (more usually found on synths) where you can hold any chord, freeze it and then play it from a single finger. There’s also transpose and a chord enhancer, which auto-adds notes to chords on certain sounds. In the middle is a clear white-on-black screen with four cursor buttons for navigation, and the ‘song level’ dial, which can be used for fast data entry. There’s menu-diving involved for tweaking effects and other parameters, but it’s easy enough to navigate. The S7’s T2L sound engine packs an impressive punch on paper and combines sampling and modelling technology, powered by a 12-layer quad-core processor. The samples were taken at 24bit/48kHz, with up to 15-second samples for the lower notes and ‘320 oscillator’ polyphony (ie, unlimited for big glisses!). These pianos really do sound great, and the inclusion of sympathetic resonance, note-off noise and pedal noise for the acoustic pianos really adds to the authentic feel and sound. We found the overall playing experience to be immersive and inspiring, and the S7 has some serious acoustic piano sounds onboard, including six popular modern pianos and one ‘Fabrini collection’ piano. The selection of available sounds is versatile too, with a VIVO Grand and pop/rock variations, (plus an upright) and there are new sounds coming via Dexibell’s website soon. The electric pianos (whilst not being quite as authentic as the acoustic’s), do sound solid and they’re nicely dynamic, plus you have control over the bell, growl and cabinet resonance elements for adding more realism. With some reverb, auto-panning and a little overdrive/phaser you’re all set for making classic EP sounds and you’ll find Suitcase, Dyno, FM, Wurli and phaser EPs available. There’s a broad selection of other useful sounds including clavs (no wah/auto-wah effect), vibes, marimba, some good sounding B3 emulations (with a pretty decent rotary emulation, though no drawbar mode), some nice acoustic strings, plus useful synth sounds (including synth basses, leads, brass, super-saws and warm poly-pads). All things considered, this is a largely solid first launch into the competitive stage piano market. The S7 is priced right, it’s pretty portable and seemingly well-built, sounds great for the all-important piano sounds and has decent effects and connectivity. This newest kid on the block surely has a promising future!